Demand for the luxury SUV means the range is likely to include faster Bentayga Speed models in future. The Bentley Bentayga is only just launching in markets around the world, but the company is already looking to expand its SUV line-up with faster ‘Speed’ versions and all-new models. Speaking at the Beijing Motor Show where he was launching the new Mulsanne to the Chinese market, Bentley chief executive Wolfgang Durheimer told us that China’s demand for SUVs increased the likelihood of the next model in the Bentley line-up being another SUV. Bentley is due to decide between a smaller ‘baby-Bentayga’ SUV or a production version of the EXP 10 Speed 6 sports car concept shown at the Geneva show in 2015. Currently the Bentayga is fitted with a 600bhp 6.0-litre W12 petrol engine, with diesel and plug-in hybrid models to follow. 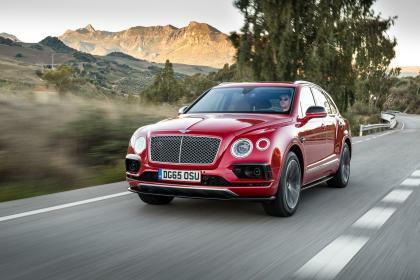 The prospect of a Speed version of the Bentayga could up the W12’s power by around 50bhp if we were to expect a similar power hike to the Continental GT Speed over the standard Continental GT – both of which use older versions of the W12 engine. Assuming a similar price premium as the Speed model of the Contintental, we’d expect a Bentayga Speed to cost in the region of £180,000, up from the current car’s £160,200. Mr Durheimer also told us that he’s expecting a Bentley sales surge in China once the government relaxes its anti-corruption investigations into wealthy individuals. He feels it’s potentially putting off buyers of luxury vehicles who don’t want to draw attention to themselves. “With this anti-corruption subject it is bringing our market position a little bit out of balance. People are afraid to show what they achieved, but they would like to show it because they’re working very hard – there’s a nervousness. “We are following this anti-corruption subject very closely to understand how long it will go on for. The projections are that as soon as the government drops the aggressiveness with how they execute this anti-corruption programme, things will normalise. Then I forecast a boom to our products.